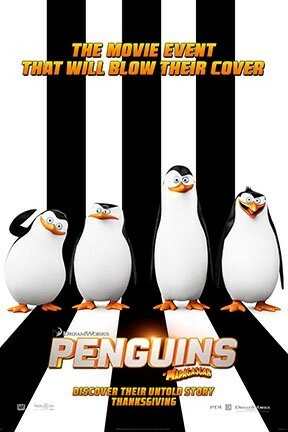 Plucky penguins Skipper (Tom McGrath), Kowalski (Chris Miller), Rico (Conrad Vernon) and Private (Christopher Knights) -- the most elite spies ever hatched -- join forces with a chic undercover organization known as the North Wind. Led by highly trained, handsome and arrogant Agent Classified (Benedict Cumberbatch), this special inter-species task force must stop a many-tentacled villain, Dr. Octavius Brine (John Malkovich), from destroying the world. Penguins of Madagascar and Penguins of Madagascar 3D are not showing in any theaters in the area.